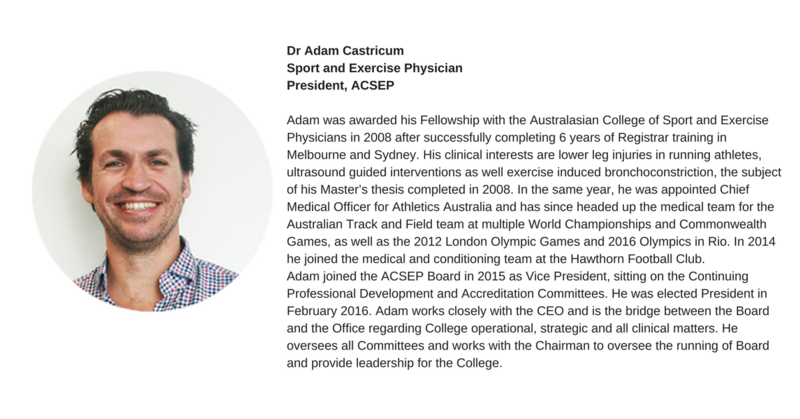 The Australasian College of Sport and Exercise Physicians (ACSEP) hosted their 2017 Annual Scientific Conference in early February on the Gold Coast, with the theme “Keeping you Active”. In keeping with the recent change of name to embrace Exercise as a powerful tool in the fight against chronic disease, there were a number of excellent keynote presentations from speakers both local and international. One of the highlights of the program was a series of presentations on the role of exercise in the management of cancer, presented by Professor Daniel Galvao, from Edith Cowan University in Western Australia. Professor Galvao presented an increasing body of evidence that supported the use of exercise therapy in the management of a number of cancers. It is well known that the cause of many cancers is multifactorial with inactivity considered one of the many risk factors, particularly for breast and colorectal cancers. Regular physical activity alone can decrease the risk of developing cancer, in particular, colorectal, breast and endometrial, with emerging evidence associated with reduced risk of other cancers including prostate, lung and ovarian. With a healthy diet, regular activity can also help reduce body weight, especially as obesity is another risk factor for the development of cancer. For those with cancer, both during and following cancer treatment, regular exercise has been shown to improve physical and psychosocial outcomes, compliance with treatment regimes, reduce the impact of disease symptoms and treatment related side effects and improve survival rates for some cancers. For patients with prostate cancer receiving androgen deprivation therapy (ADT), resistance exercises were shown to improve quality of life and muscular fitness. In particular, exercise showed high level evidence that it improved a number of key endpoints for those with prostate cancer receiving such ADT therapy or radiotherapy, including muscle strength, aerobic fitness, body composition, physical function and quality of life. In fact, combined resistance and aerobic exercise programs were shown to reverse muscle loss in men undergoing ADT. Significantly, in those with metastatic prostate cancer, regular exercise was shown to significantly improve self-reported physical function. There is exciting evidence to show that regular exercise helps reduce toxicities and reduce side effects from chemotherapy. In fact, performing aerobic and resistance exercise soon after receiving chemotherapy has been shown to increase the dose of chemotherapy to the tissues helping to achieve the therapeutic dose, whilst reducing side effects. Preliminary evidence suggest that regular exercise may delay progression and transition to active therapy, reduce the risk of recurrence and more than 3 hours of vigorous activity a week will produce improved survival rates for those with prostate cancer. When prescribing exercise, it is important the program is individualized to the patient, with special consideration of past and current fitness levels, exercise and activity preferences, previous and planned cancer treatment, disease and treatment related risk factors, the presence and severity of symptoms and the goals of each patient. The overall aim is to meet the physical activity guidelines for the general population. Start gradually and gently with incidental activity and encourage more than less activity. Gradually introduce aerobic exercise such as walking, cycling or swimming aiming to build up to 150 minutes of moderate intensity (puffing) exercise, or 75 minutes of high intensity (heavy puffing) exercise weekly. It is vital to include two resistance exercise sessions a week on non-consecutive days, looking to include major muscle groups, using weights, body weight or theraband exercises. This certainly is an exciting field of Exercise Medicine and a further weapon in the fight against cancer. Exercise alone should not replace conventional evidence based treatments for cancer and you should always check with your oncologist before starting any exercise program. I’m sure we all look forward to more excellent research and recommendations from Professor Galvao and his group, and indeed all researchers working in this important space.